Now a massive star in Ireland, native New Yorker, Des moved from Queens to Ireland in his mid-teens in 1990. 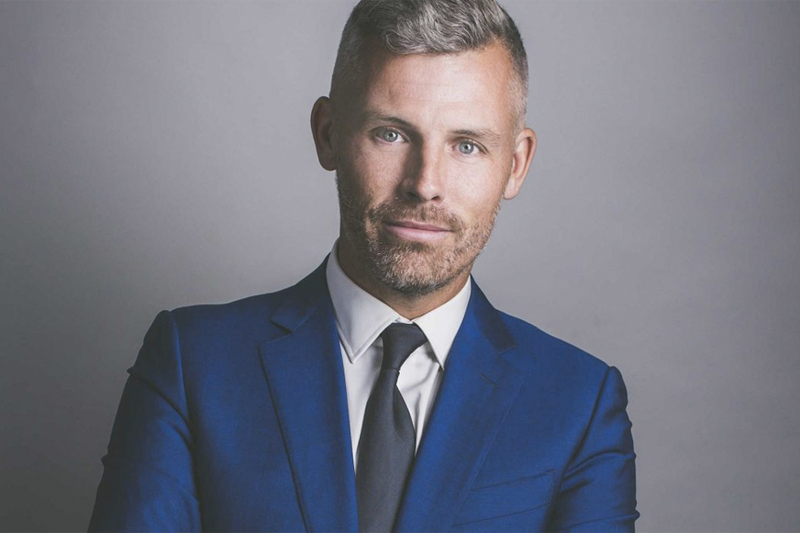 He first came to prominence with his extraordinary TV series The Des Bishop Work Experience (2004), where he lived on minimum wage in a series of different jobs in Ireland. Mixing this documentary footage with stand-up, the series became one of the most talked-about of the year, and propelled Des into national stardom. In 2006, he embarked on his second critically acclaimed TV series, Joy In The Hood, where he taught stand-up comedy in disadvantaged areas in four major Irish cities. Another hugely successful live tour followed including invitations to the Just For Laughs Festival in Montreal and the Melbourne Comedy Festival in Australia. In 2007/8 Des embarked on his most ambitious and challenging TV programme to date: he decided to learn Irish from scratch and perform a 60 minute stand-up comedy routine in the Irish language. Over the course of 12 months, he lived with a family in the West Of Ireland honing his craft and in March 2008, the first episode of In The Name Of The Fada was broadcast. In The Name Of The Fada has prompted a radical re-think about how to teach Irish in schools and it unsurprisingly won the Irish Film and Television Award (IFTA) for Best Television Series later that year. In 2010, Des put together his most personal show to date called My Dad Was Nearly James Bond. Inspired by his father, Mike who was diagnosed with terminal cancer; Des documented the remarkable life of an actor and model who gave up the glamour for a steady job in a department store when his three sons were born. Des also wrote a memoir by the same name, which was short-listed for an Irish Book Of The Year Award. The My Dad Was Nearly James Bond live show previewed in Melbourne, before opening at the Edinburgh Fringe Festival to widespread acclaim and five star reviews including Brian Logan of The Guardian who called it “a coup de théâtre…compelling…like diamonds, this show is forever”. The show toured extensively both nationally and internationally in 2010/11 including The Barrow Street Theatre in New York. Des’s most recent project took him to Beijing, China in 2013 to learn Mandarin and he has been living there for the past 18 months. He is now fluent and the show, Breaking China was another major hit for broadcaster RTE in 2014 and he also made a half hour radio documentary about the rise of Stand Up in China for the BBC World Service called “Stand up for China”. His live show again opened at the Edinburgh Festival where he played to over 5,000 people and included an invitation to perform at the Soho Theatre in London and a return to Barrow Street in New York. Des has appeared on many live stand up shows including Edinburgh Comedy Festival Live (BBC), Live at the Comedy Store (Comedy Central) and Australian music themed quiz show Spicks and Specks (ABC). He was also the star of HBO’s “A Comic’s Climb” about his debut at the Aspen Comedy festival in 2005. His latest special, “Made in China” will be released by Universal Pictures in November 2015. The openness and honesty of his presenting style combined with his restless imagination and perceptive comic observations make Des Bishop a must-see for fans of unique, insightful and provocative comedy.